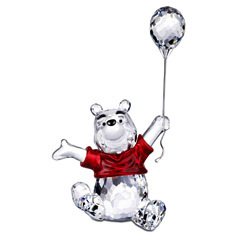 Winnie-the-Pooh, commonly shortened to Pooh Bear and once referred to as Edward Bear, is a fictional bear created by A. A. Milne. The character first appeared in book form in Winnie-the-Pooh (1926) and The House at Pooh Corner (1928). 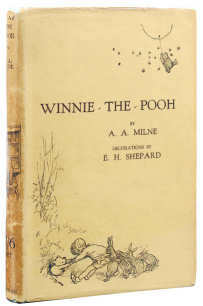 Pictured right: Milne (A.A.) Winnie-the-Pooh, first edition , illustrations and map endpapers by E.H.Shepard, very slight browning to free endpapers, original gilt-pictorial green cloth, a fine copy, t.e.g., dust-jacket, spine browned and slightly chipped, very good, 8vo, 1926. Sold for £500 ($800) at Bloomsbury Auction, 6th November 2008. A near mint condition book would fetch many thousands. Milne also included several poems about Winnie-the-Pooh in the children’s poetry books When We Were Very Young and Now We Are Six. 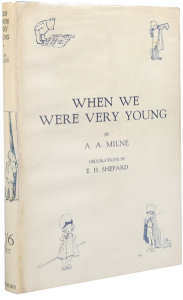 All four volumes were illustrated by E. H. Shepard. Pictured left: Original Winnie the Pooh stuffed toys. Clockwise from bottom left: Tigger, Kanga, Edward Bear (aka Winnie-the-Pooh), Eeyore, and Piglet. Image courtesy of Wikipedia Project. Milne named the character Winnie-the-Pooh after a teddy bear owned by his son, Christopher Robin Milne, who was the basis for the character Christopher Robin. His toys also lent their names to most of the other characters, except for Owl and Rabbit, who were probably based on real animals, and the Gopher character, who was added in the Disney version. 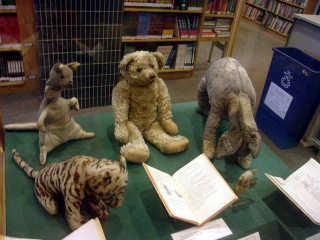 Christopher Robin’s toy bear is now on display at the Main Branch of the New York Public Library in New York. Pictured right: Christopher Robin Series I, 1986-87, 18″, molded felt, fully jointed, smock outfit, leather sandals. Boxed together with 8″ mohair/wool Winnie-the-Pooh. Christopher Milne had named his teddy after Winnipeg, a bear which he and his father often saw at London Zoo, and “Pooh”, a swan they had met while on holiday. Winnipeg the Bear was purchased from a hunter for $20 by Canadian Lieutenant Harry Colebourn in White River, Ontario, Canada, while en-route to England during the First World War. He named the bear “Winnipeg” after his hometown in Winnipeg, Manitoba. “Winnie”, as she became known, was surreptitiously brought to England with her owner, and gained unofficial recognition as a regimental mascot. Colebourn left Winnie at the London Zoo while he and his un it were in France; after the war she was officially donated to the zoo, as she had become a much loved attraction there. Among her many young fans was Christopher Milne, who named his own teddy bear “Winnie”. Pooh the swan appears as a character in its own right in When We Were Very Young. Pooh first appeared in December 1925, when what became the first chapter of the book Winnie-the-Pooh was commissioned as a Christmas story by London’s Evening News. The book was published in October 1926 by Methuen, the London publisher of Milne’s earlier children’s work When We Were Very Young. The illustrator was E.H. Shepard, who had also drawn the pictures for the earlier book. Pictured right: From the current range of Royal Doulton figurines Winnie the Pooh – It’s Honey All The Way Down – This is a typical Winnie the Pooh predicament – desperate for hunny and searching all the trees in the Hundred Acre wood, especially those with a bit of a buzz about them. Hence the delicately observed bees that punctuate this piece. 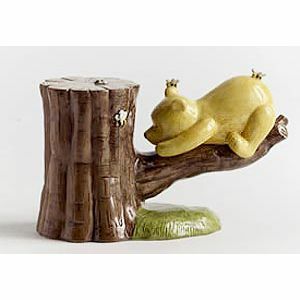 A most charming depiction of Winnie the Pooh out on a limb, part of the highly collectable, highly presentable Classic Winnie the Pooh range of figurines from Royal Doulton. © Disney. On Jan. 6, 1930, Stephen Slesinger purchased US and Canadian merchandising, television, recording and other trade rights to the “Winnie-the-Pooh” works from Milne for a $1000 advance and 66% of Slesinger’s income, creating the modern licensing industry. By 1938, Pooh was a $50 million-a-year business. Slesinger marketed Pooh and his friends for 20 years, creating the first Pooh doll, record, board game, puzzle, doll, US radio broadcast (NBC), animation and film. Disney acquired rights from Slesinger to produce a feature animation which appeared 1961. Since 1966, Disney has released numerous features starring Winnie the Pooh and related characters. Along with the animated films and TV series there has been an enormous range of Disney related collectibles and memorabilia from lithographs to snowglobes and from figurines to Disney beanies. Pooh remains a very popular character and with Disney continuing to market the character he looks set to stay as the most collected bear.